Fall is here. Knowing it would make its entrance one night as we slept, we did our best to enjoy every last summer evening on our patio. The very last one, we had artichokes and my friend Stephanie's famous burgers. The full step by step after the jump. Artichokes are definitely one of my favorite foods. 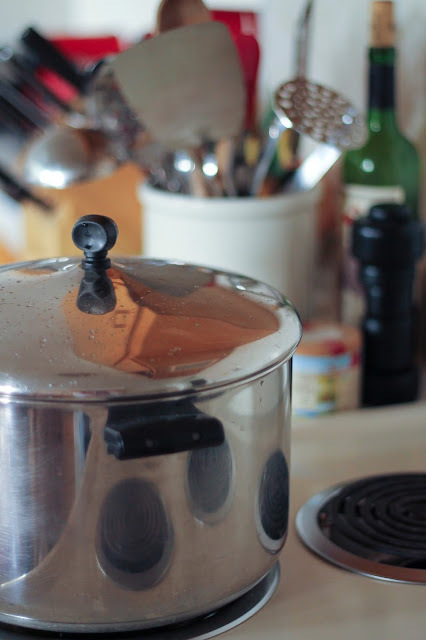 They're easy to cook in a pressure cooker if you have one, but if not, just follow these simple instructions. After you've rinsed your artichokes well, trim the sharp prickly points off of the leaves. Arrange on a steamer basket in a large stock pot. Fill until the water is at the level of the basket. Throw in a few lemon slices, a half cup of white wine, and sprinkle with Kosher salt. Make sure the pot you use has a snug fitting lid and bring to a boil. You'll need to add another 8-16 ounces of water half way though. Let them steam for 30-45 minutes with the lid on, until the base is tender. Mix well with your hands, then form six small patties, making a thumb-sized dimple in each one. Grill on the barbecue. When each dimple fills with liquid, they're ready to flip and add cheese. We used a Danish Blue. Save the uncooked patties for the next day if you don't need all of them. They also cook up nicely in a hot oven under the broiler. For the artichokes, 1/2 cup mayonnaise blended with the juice of 1/2 lemon is the perfect dipping sauce. Bon appetit! Farewell, summer. And welcome, fall.